Monday 5/17: BBN at lunch. No luck with the Hooded Warbler (eventually reported to have been present earlier in the morning) but a first spring Orchard Oriole wasn’t bad. Good number of butterflies, plus a Common Whitetail on the ride over. Tuesday 5/18: Checked Paine. School group was running around screaming and the birds were slow. Spicebush Swallowtail was the only thing of note. Wednesday 5/19: Checked Hardy Pond briefly in the rain, 7 cormorants were it. Thursday 5/20: Prospect Hill before work had a few things (gate wasn’t open for some reason so I had to run up the hill and didn’t really reach the areas I wanted to check) including a Chestnut-sided or two, a Northern Waterthrush, and first of year Peck’s Skipper. The Charles at lunch was quiet but an Ebony Jewelwing flew in front of the car on the way back. After work was better and a nighthawk overhead around 7 was a good conclusion. Friday 5/21: Beaver Brook: Bluebird, Swainson’s Thrush, Magnolia Warbler, Empid sp, plus a bunch more jewelwings. Saturday 5/22: Joined the MBC walk at Horn Pond. Fairly slow, first of year Willow Flycatchers being the highlight. Couple of us continued on nearby and got audio of a Mourning Warbler that was hanging out. Sunday 5/23: MBC Century Run, more coming but we fell a bit short. Monday 5/10: Prospect Hill had a couple interesting potential breeders. Tuesday 5/11: Charles: Least Flycatcher, Wilson’s Warbler plus the regulars. Wednesday 5/12: Hardy Pond had a big flock of swallows including 4 Cliff. Afternoon walk over added Spotted Sandpiper. Thursday 5/13: BBN before work: Common Loon, Least Flycatcher, several warblers including Magnolia, Eastern Wood-Pewee. Duck ponds at lunch had family of Wood Ducks, a catbird that really sounded like a Yellow Warbler and several Red Admirals (although first of year was at work on the way). Friday 5/14: Beaver Brook had a Magnolia, 2 Redstarts, and a Blue-headed Vireo (and more but I spent too much time chasing a Yellow Warbler around a cedar). Stepped outside at 6 to get the birdathon count going and 2 Osprey flew over! Saturday 5/15: Birdathon, separate post coming but 2 greenway ticks got me over 150. Sunday 5/16: Mt. Auburn for the BBC. First loop had poor view of a Bay-breasted and better views of a Wilson’s but not a whole lot more. Went back for a second loop (now that the birdathoners were awake and around) and had a nice Canada, heard more Bay-breasts, etc. Finally got Chestnut-sided and Veery for the year. Slept the rest of the day. Monday 5/3: Woke up to a Swainson’s Thrush singing, second yard record I think. Quick stop at Hardy Pond at lunch had another Orchard Oriole along with Tree Swallows working on a nest. Thrasher singing behind work in the afternoon. Tuesday 5/4: Graverson loop in the morning had House Wren, continuing Waterthrush, and BT Green. Yellow Warbler singing along Lexington St. Prospect Hill at lunch had Indigo Buntings, many butterflies (2 swallowtails, ETB, copper, etc), 1 darner (presuming Springtime). Wednesday 5/5: Car finally fixed, quick stop at the Woerd Ave boat ramp had a bunch of Rough-winged Swallows and Warbling Vireos. Thursday 5/6: Graverson loop had nothing new. BBN at lunch had a ton of summer residents arriving (Scarlet Tanager, Indigo Bunting, Blue-winged Warbler, Rose-breasted Grosbeak, Yellow-billed Cuckoo) plus Solitary Sandpiper. Also very early (record early?) Hobomok Skipper among other butterflies and my first Common Whitetails of the year. Friday 5/7: Ended up at Beaver Brook eventually, few Rose-breasted Grosbeaks and not much else. Baskettail was new for the year. Saturday 5/8: Trip got rained out. Scarlet Tanager, Black-and-white Warbler, thrush in the yard. Rain stopped briefly so ran to Arlington Res and got soaked but a few Bank Swallows and a yellowlegs weren’t bad. Out to Ethan’s after that, where I could hear Ovenbird among several warblers and saw a Red-eyed Vireo. Sunday 5/9: Still at Ethan’s but too cold and windy to go out. Best views I’ve had of a black squirrel at his feeder. Nothing much on the ride home or around the house. Monday 4/26: Checked Forest Grove at lunch, 1 yellow-rump, 1 forktail. Tuesday 4/27: Hardy Pond had a couple Barn Swallows mixed in with many Tree. Wednesday 4/28: Paine Estate was quiet. Thursday 4/29: Too windy at Prospect Hill but did have what was most likely a Bald Eagle over the Cambridge Res (lost it before I could be certain but nothing else it could have been). Friday 4/30: Started for Beaver Brook in the morning but had car issues, so only managed 30 minutes. Few yellow-rumps, 1 Hermit Thrush were all I could find. Car trouble prevented me from going out at lunch, but a Peregrine over the Charles at Moody St later was very nice. Saturday 5/1: Led the BBC trip to Mt. Auburn. Went into Boston with parents and uncle later in the day. Public garden was too crowded by then, but 3 Black-crowned Night-Herons along the Charles were nice. Sunday 5/2: Graverson/Hardy Pond loop had an Eastern Kingbird, Northern Waterthrush, and Common Yellowthroat (and a Chimney Swift when repeating the walk in the afternoon). Arlington Res had 4(!) 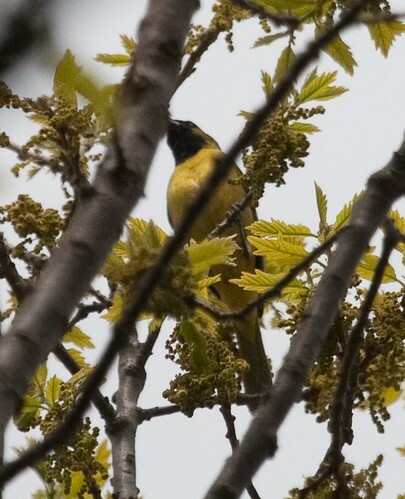 Orchard Orioles, many Warbling Vireos and Kingbirds but not much else. Monday 4/19: Went to the Littleton Rookery where the Red-headed Woodpecker eventually showed off. Also pair of Osprey, Wood Ducks in the trees and entering a hole, etc. Continued to Assabet River where I couldn’t find the gos but did have Purple Finch, Rusty Blackbird, 2 Kestrels, and a Woodcock. Tuesday 4/20: Paine was fairly quiet but a few Yellow-rumps were recent arrivals. Wednesday 4/21: Duck ponds were dead other than a Clouded Sulphur. Did Graverson/Hardy Pond loop twice and had Blue-headed Vireo, Kingfisher, and Savannah Sparrow. Thursday 4/22: Prospect Hill had a few butterflies (Juvenal’s Duskywings mostly) but nothing for birds. Friday 4/23: Walked the trail behind work at lunch, not much of anything today. Saturday 4/24: Did garlic mustard removal at Lot 1 in the morning, first forktails of the year there. Great Meadows in the afternoon was pretty quiet, but FOY gnatcatchers and coots (finally) and an Osprey, plus more forktails and a green darner. Also 40 cormorants flying over the street after dinner. Sunday 4/25: Started at BBN. Walked for probably 2 miles and all the good birds were next to the car: few Palms, couple Yellow-rumps, 3 Savannahs, 1 Towhee, 1 gobbling turkey. Continued to Hayden Woods where a Rusty Blackbird was singing but otherwise quiet. 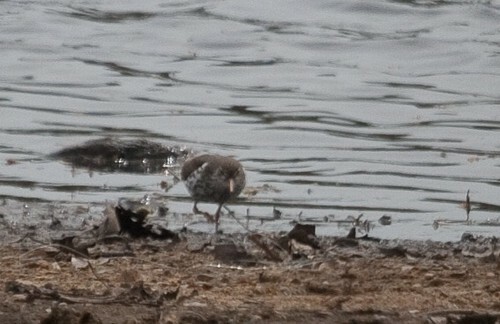 Arlington Res had pretty much no migrants, Spotted Sandpiper was new but nothing else. Tiger Swallowtail in the yard in the afternoon. Monday 4/12: Prospect Hill: 2 Hermit Thrush, 6+ flickers. Wednesday 4/14: Forest Grove was quiet. Thursday 4/15: Checked Hayden Woods on the way to work: 2 Palms, singing Hermit Thrush, not much else. Friday 4/16: Duck Ponds at lunch. Not much there, but 3 turkeys on the way back. Got out of work early so stopped at Hardy Pond, where 2 Common Mergansers continued with a bunch of Tree Swallows. Saturday 4/17: Cruised around a bit in the rain. Big flock of cormorants on Cambridge Res and 2 Ring-necks at Flint’s Pond where all I could come up with. Sunday 4/18: Joined the Menotomy trip at Horn Pond (added 4 birds to my Horn Pond list: Turkey Vulture, shoveler, sapsucker, and black duck). Stopped at Arlington Res on the way home and found a bunch of Palms and Yellow-rumps and not much else. Also finally walked the trail from Hardy Pond to Graverson, will likely make a regular loop here in the next couple months. Monday 4/5: Checked the parkway at BBN without much of anything. Tuesday 4/6: Had a meeting at 12 so had to make an early lunch run. Quick stop at Hardy Pond had a 1-2 Wood Ducks and not much else. Wednesday 4/7: Prospect Hill: 2 Cabbage White, 1 Mourning Cloak, first Six-spotted Tiger Beetle of the year, not much else. Struck out on woodcock again at night. Hairy came back though. Thursday 4/8: Merlin down the street before work. Nothing along Woerd Ave at lunch. Friday 4/9: Too rainy for much but there were quite a few Tree Swallows at Hardy Pond finally. Also checked Hayden Woods (more Palms and a Pine) and Prospect Hill (first Hermit Thrush of the year). Sunday 4/11: Dunback had a couple singing Ruby-crowned Kinglets and a Chipping Sparrow. A few Palms and a Rough-winged Swallow at Mt. Auburn. The ibis at Nine Acre Corner cooperated and there were a couple snipe at the School St. Fields. Monday 3/29: Rainy but checked Woerd Ave briefly (3 Wood Duck) and Moody St (the Double-crested Cormorant that flew over on the way down was just below the waterfall on the way back). Tuesday 3/30: Little too rainy to put it lightly. Did end up at Hardy Pond but too wet to even roll the window down. I know there were a few Common Mergansers out there but no clue what else. Wednesday 3/31: Walked the road at Prospect Hill a bit but nothing worth mentioning. Thursday 4/1: Paine: 2 Pine Warblers, 2-3 Phoebes. Friday 4/2: Day off. Started at Dunback. Long walk looking for Red-shoulders and Fox Sparrows without any. Two phoebes were about it. Quick stops at the Beaver Brook Ponds and Hardy Pond didn’t have much either. Afternoon trip to Arlington Res was about equally productive. Saturday 4/3: Decided to try and find an Upland Sandpiper at Hanscom. No luck with that, but first of year Swamp Sparrow, Field Sparrows, Wild Turkey (displaying), and Eastern Meadowlark plus a kestrel made it worthwhile. Also a brief walk at Assabet River NWR added Spring Azure and the Infant (moth). Sunday 4/4: Rock Meadow and BBN were both pretty quiet. Many Tree Swallows at Rock Meadow. Field and Swamp Sparrows were both in at BBN along with a flock of Cedar Waxwings. 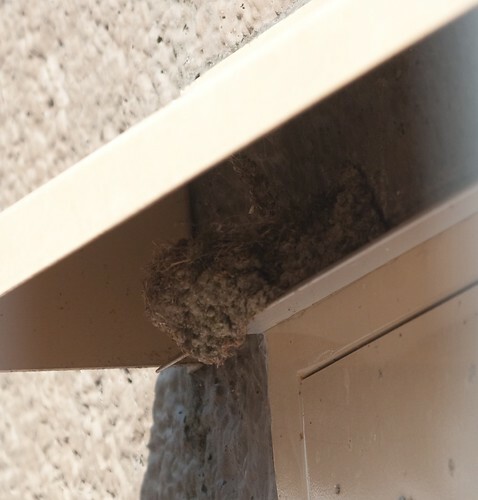 Phoebes were building a nest at the water tower. Forgetful: Hairy in the yard, one of a handful of records. Woodcock walk for WLT at night ended up not seeing any, not sure why. Monday 3/22: Prospect Hill in the drizzle. Killdeer flying over turned out to be new for me at the site but otherwise very little. Tuesday 3/23: Hardy Pond in the heavier rain. Scanned quickly as I pulled up and saw 2 Bufflehead and almost didn’t bother looking again after I ate. Good thing I did as I immediately rushed out of the car to get the scope on 3 Lesser Scaup. Otherwise about the same as the last week (wigeon were up to 4 but no new arrivals). Wednesday 3/24: Woerd Ave at lunch. Too windy and wet to find much, but 8 ring-necks were in the cove. Thursday 3/25: Took a long walk at Beaver Brook North but didn’t see much of anything. Friday 3/26: Cold and didn’t go out. Saturday 3/27: Dunback and Waltham St. in the morning. Red-shouldered Hawk was the big highlight, but several Wilson’s Snipe weren’t bad either. Arlington Res later was pretty quiet. Sunday 3/28: Did some work on future trail locations at Lot 1 in the morning. Poked around a bit first without much of anything. Since the Sage Thrasher was back at Salisbury, I finally made the effort in the afternoon and watched it feed for about 40 minutes (pictures sooner or later, other things are more important right now). Tuesday 3/16: Back side of Prospect Hill as it was likely the only place not under water or all mud. First Mourning Cloak of the year. Wednesday 3/17: BBN without much of note. 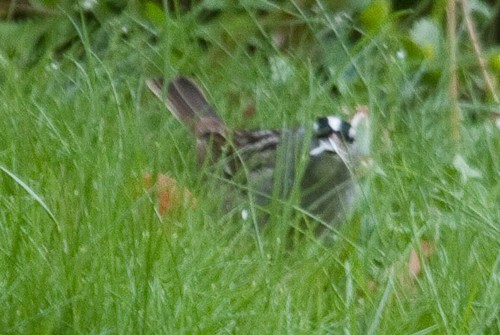 Thursday 3/18: Had a Killdeer while running to another school today and then Wood Frogs at Paine (plus another cloak). Peepers were out at the end of the street after dark, probably should have been checking for the last few days. Friday 3/19: Beaver Brook Ponds: no birds of note but the storm damage was impressive, a large part of the back trail was washed out and there were a couple big sink holes. Woodcock watching at night was limited by the water covering all the trails but we still heard 3 from Falzone Field. A bat was flying around as well. Weekend 3/20-21: Posted separately. Hardy Pond had the same wigeon/bufflehead/hoodies.